Ben Gibbard churns out stirring one-liners at a staggering rate. His lyrics inspire the world's arty 19-year-old females to go ahead and get that shoulder tattoo or file to study abroad in Osaka. Hell, one might have even inspired Zooey Daschanel to unconditionally dedicate herself to him forever. If that's not a success metric, I don't know what is. But what does Ben Gibbard offer the "mid-20s dude" demographic? Not a lot, in my experience. 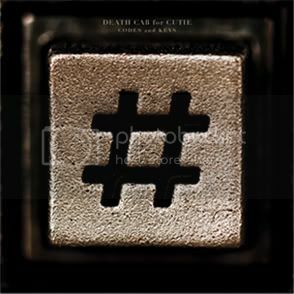 I don't mind Death Cab, but something about their presentation has never drawn me in. This is something I've harbored for a long time, even back when I was a member of that doe-eyed indie kid subculture. My principle gripe? It's Ben's voice. As I've written before, I hate this as an excuse. Besides, Gibbard's pipes aren't repellant, they just don't pack any punch. They're like fat-free Colin Meloy or Jeff Mangum. There exists a certain mechanical quality about his singing that, to his credit, complements the band's sound. But his words seem to dissipate before I ever absorb what he's saying. But alas, they're a respected act, and fit nicely in our little feature. And truth be told, Codes and Keys isn't a bad album. In fact, it's downright engaging at times. The band sounds tight and confident, as they should be. The band's core, after all, has been in tact for nearly 15 years. Still, there exists a glass ceiling over my ability to get excited about Death Cab. It's not them, it's me. The lead single, "You Are a Tourist" is the archetypal Gibbard-as-cheerleader lyric set ("Sometimes the best intentions/are in need of redemptions/would you agree/if so please show me.") It's sure to find its way on a few mix-CDs and probably a FOX teen drama, but it falls short of, say, Modest Mouse's "Float On" as an indie-pop single. Also, what's with the panting on "Some Boys"? The album has its flaws, but there are winning moments throughout. The pulsing opener "Home Is a Fire" skitters along at an anxious pace, and proves a capable tone setter. The chase-scene-worthy "Doors Unlocked and Open", the album's best track, pulls Gibbard's vocals back into the mix, allowing the bassline to bore a path through both the frenetic verses and the vivacious chorus. The snappy drums and guitar nod towards Phoenix (the band, that is) and that's a comparison worth striving for. Throwing the "underneath a tree" gauntlet at the feet of Toro y Moi, "Underneath the Sycamore" is unspectacular but amiably upbeat. Is this an album I'll get excited over each time I see it on my iPod scroll? Unlikely. Will I call upon it when I've burned out on all my A material and be summarily satisfied? Absolutely. Such could describe my appreciation for Death Cab as a whole, I suppose. This marks our final review of the feature. Look for a post today, this weekend, or early next week that wraps up this two-month shindig.